specific writing guidelines for rewarding the youngest, pre-literate audiences. With all the theory out of the way, this week I'll focus on guidelines for the book categories targeted at beginning readers: kids who are just learning to read but probably aren't fully independent, confident readers yet. The ages in that group can vary quite a lot, depending on all kinds of individual and socio-economic factors, whether the parents are readers, whether the kid has access to books in the home, and so forth. Regardless, today we're looking at books for kids age 5 to 10, give or take. By "advanced picture book," I mean a subset of picture books whose content is are aimed more at kids just learning to read than at kids who mostly still have parents read picture books to them. There's a ton of overlap between those two kinds of picture books, but here I'm talking about books that address the shift from kid-as-listener to kid-as-reader. Advanced picture books meld the art-heavy qualities of picture books with the longer stories, and more complex or serious themes of early reader and middle-grade. With advanced picture books, you're writing for kids who are barely literate. These books are often their first foray into independent reading, and are grappling with the intense cognitive demands reading makes. If you've ever studied a foreign language as an adult, you will have some sense for what this is like. Deciphering the meaning of each individual word, and putting them all together with the grammatical cues scattered across the sentence, is real work. Stumbling over words you haven't learned yet only adds to the challenge. It's the same for kids. They're still learning how to turn jumbles of letters into sounds in their head which match some word they may know. They're still learning their way around the bizarre spelling and syllable-breaking patterns in English. And they too are going to stumble over words they don't know. All of which means that the level of work is very high. So high, that you basically need to provide a meaningful reward with every sentence you write. And I'll be honest: if you don't respect how hard kids are working, I don't think you should be trying to write for them at all. What Should You Write and How Should You Write It? As stories, I don't see a lot of daylight between advanced picture books and regular picture books. They tend to be single-situation plots with minimal conflict between characters, et cetera. Look back at last week's article for the full list of picture book story qualities. What's different here is that each story can be developed more fully. The text-to-art ratio shifts again so that the text carries more of the burden of conveying the story. Thus, you have a greater wordcount budget to play with. I do see the subject matter in advanced picture books being a little different, though. Yes, these books can accommodate the same range of fantasy/fiction stories as regular picture books. But in addition, advanced picture books admit stories that are historical non-fiction and personal memoir. Two books, Fannie in the Kitchen and The Art of Miss Chew spring to mind as good examples. Write clearly and directly. Poetry and high literature have their place, but that place is not for kids who are struggling just to master the basics. Save your subtle metaphors and allegorical devices for that novel you're going to write someday, and for now, keep it simple. Use common words over uncommon ones. Don't use a long word where a short one will do, because remember, your readers' vocabularies are not all that huge yet. But, do introduce new vocabulary from time to time. Your reader's limited vocabulary is both a challenge an an opportunity; be conscious of which words may be new to kids, and use them in ways that are strongly supported by context. Reading is one of the prime ways kids learn new words, and context is the best guide they have to figuring out what the word might mean. Keep your sentences short. A compound sentence (two independent clauses joined with a conjunction) now and then is fine. So is the occasional complex sentence (an independent clause plus a dependent clause). But do stay away from the compound/complex sentences with multiple independent and dependent clauses. Just remember that the more words you put into a single sentence, the more you're asking kids to juggle in their short-term memory before they can get the meaning from the sentence. Reward them with every sentence. If your story is fiction or narrative non-fiction, every sentence should advance the story in some meaningful way. If you're writing non-fiction, every sentence should present the reader with some interesting fact. There will be exceptions and times when you need two short sentences to convey the reward--that's ok. So long as most every sentence answers the question "what's the reward," you're good. 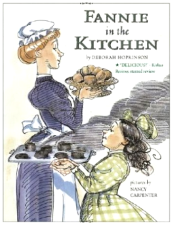 Deborah Hopkinson's Fannie in the Kitchen is a charming picture book biography of Fannie Farmer, the woman who gave the world the whole concept of recipes with measurements. It centers on the period of Farmer's life when she worked for the Shaw family, and tells the story of how the family's daughter Marcia prompted Fannie to write the first version of her epochal cookbook. Fannie was making griddle cakes, golden brown and steaming hot, as Marcia watched. "The biggest mistake with griddle cakes," said Fannie, waving her turner, "is to flip them at the wrong time." "When is the right time?" asked Marcia. "Look at this one," Fannie instructed. "Is it puffed?" Marcia looked closely. "It's puffed." "Is it full of bubbles?" "Then now is precisely the right time." With one sweep Fannie flipped the cake in the air and neatly back onto the griddle. The writing is very clear and direct by using uncluttered grammar that gets straight to the point. The majority of the sentences are grammatical simple-sentences, with just a subject and a single predicate. Even the complex sentences (the first, second, and last ones in the example) are easy to follow because they convey a very direct line of action from beginning to end. The text prefers common words like "making" and "looked closely" over fancier alternatives such as "pan-frying" and "examined", yet still works to introduce new vocabulary. This book may well be a kid's first exposure to "precisely", but notice how the context helps readers figure out what the word means: we see Fannie define a set of criteria about puffiness and bubbles, and because "precisely" modifies "right," (which contrasts the use of "wrong" earlier in the scene) kids learn that "precisely" carries a sense of exactitude about it. You'll have to take my word for it that the pictures back up the meaning of nouns like "griddle" and "turner", which may also be unfamiliar. And finally, each sentence gives a reward. The first sentence puts the two characters together in an activity; in the context of the larger story, this advances the plot by showing a turning point in Marcia's attitude towards Fannie. The second sentence offers tantalizing promise of learning something of practical value. The third sentence allows Marcia to voice the exact same question that is probably in kids' heads too, thus rewarding by reassuring them that they're staying on track. See if you can determine the reward each of the other sentences offers. Early reader books (at least in the U.S.) are the slim paperback books, typically sold at low prices, and specifically aimed at different levels of beginning readers. The reading level is always shown prominently on the cover. While the expectation is that kids will be reading them on their own (that's the point of them), they can be a lot of fun for grown-ups to read to their kids as well. On the lower end, the stories can be very simple. On the high end you can get even more complex than with advanced picture books. The plots can feature both situational challenges and inter-character conflict. Older early reader books were often anthologies of a few very short stories in the same book. Judging by the unscientific sample of the ones my kids have, the early readers of newer vintage are tending towards one story per book. Art is still a significant element, but this category moves solidly out of the realm of visually-told story and into illustrated narrative. Still, the stories are pretty short. They are often just one scene that is deeply developed, or a handful of scenes paced at one per page. The stories tend to convey a message, moral, or lesson of some kind, but the most successful of these do it in a very subtle way. I can't stress that enough. This is not the time to be heavy-handed with your messaging. Literacy skills are stronger in this category, but the work is still largely in the act of independent reading itself. However, by now kids are a little older, a little more sophisticated than before. They will be looking for a larger external reward from the story for their motivation, whereas previously the internal reward of reading accomplishment may have carried them further. As such, you'd better deliver an entertaining story. Pay close attention to characterization. Make sure your characters have distinctive personalities, especially if you intend to write an Early Reader series, which in today's market you'll pretty much be expected to do if you want to have any real shot. Much as Sandra Boynton is Queen of the Board Book, I consider Arnold Lobel to be King of the Early Reader. He wrote countless early readers, with his Frog and Toad series probably the best-known and best-loved of them all. I loved these books as a kid, and I love them still. They're subtle on levels that are appealing to adults, while offering kids plenty of reward for their work. They're lovingly written and gorgeously illustrated, with art that makes exquisite use of the two-color printing process used at the time the books were new. "Hurry!" said Frog. "We will run and catch it!" That's quality material right there, folks. Classic. And I mean that. Let's break it down for story structure, message, humor and characterization. I'm sure you can see how it stacks up on the grammar, vocabulary, and sentence-reward levels. I can't quote the whole story to show you directly, but it essentially gives a handful of short scenes, basically one scene or story-moment per page. Since A List is a plot-oriented story, this structure works well to keep things moving at the "child's pace" I talked about last week. The story's message is clear: be flexible. Don't get yourself too stuck on an idea that you can't change it when circumstances render it pointless. Yet the story never puts that message on the page. Frog never chastises Toad for his behavior, never moralizes, but just sticks by his friend during a difficult time. The message is there for the reader to see, but isn't shoved down their throats. The humor in the above scene is obvious: right in the middle of a crisis, poor hapless Toad is more concerned with sticking to his list than being pragmatic. And he never gives that up until the end, either, stubbornly refusing to do anything else that day because he can't remember what else was on his list. My sources in the library-industrial complex say there's no generally accepted category name for these things yet, but as an emerging category they're sure hot stuff and worth mentioning here. These are books like the Diary of a Wimpy Kid and the Dragonbreath series, that stand in some middle ground between graphic novels and chapter books. These have more words-per-page than a graphic novel or an early reader, but are generously illustrated so kids who aren't yet super confident in their reading skills can still use the pictures as a crutch to help them figure out the story. CBWTWs form an excellent gateway drug to help bridge the otherwise kind of huge developmental gap between Early Reader books and full-on Chapter Books. And really, that's the point of them: to reward kids with delightful reading experiences and thereby show them how much fun reading can be, before they have to tackle the wall-of-text experience that is a chapter book. The work for CBWTBs is largely motivational. Kids at this stage can read, they just have trouble getting excited about doing it. The reasons may be many--exposure to bad books that didn't reward them enough earlier on; well-intentioned adults forcing on them books they weren't ready for; struggles with learning disabilities; even stressful family and home-life situations. Ultimately, it doesn't matter why a kid feels this way. But if they do, these training wheel books are a critical intervention to getting them back on track. The reward is heavily story-based. 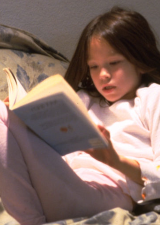 When you've got a kid who feels recalcitrant about reading, they may be reluctant to admit to anyone--even themselves--any pride they feel in accomplishing the reading. They'll downplay that, which means the reward has to come through the story itself. I cannot honestly say that I've had a whole lot of exposure to these books. They're a pretty new category, and my son was only into them for a short while before he moved on to chapter books (Thank you, Harry Potter). Make it relatable. All the training wheel books I've seen so far feature characters at essentially the same stage of age and maturity as the books' target readers. Further, the characters tend to be involved in situations that are familiar to readers' own lives: stuff having to do with school, friends, et cetera. Crank up the humor and zaniness as high as you dare. There's nothing better than a strong dose of humor to overcome a reluctant reader's inertia and get them to pick up the book. Which is not to say you can't include serious themes. The Wimpy Kid books feature bullies and other forms of crap life dishes out to kids that they really don't deserve. But the presentation of those subjects remains humorous, and therefore keeps material that could be a downer from ruining the enjoyment--and the reward--present in the book. Write a series. Because it takes more than one turn on a bike with training wheels before you're ready to take the wheels off. So if a kid reads your first training wheel book and likes it, you'd better have another one waiting to go to capitalize on that. And for better or worse, just like with Early Reader books, the publishing industry loves a good series these days. 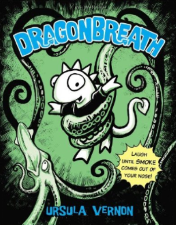 Ursula Vernon's Dragonbreath series follows the exploits of Danny Dragonbreath, through 11 books now. They just keep coming. And while I am not a huge series fan in general, if these books are helping reluctant readers fall in love with books, I'm all for her writing as many of them as she possibly can. Relatability: Danny Dragonbreath is a kid. He goes to school and has homework just like the grade-schoolers who the series is aimed at. He gets in trouble with his teacher over stuff kids can totally empathize with, that has stakes they understand. Humor and zaniness. Just to give you a taste, book 1 of this series starts with Danny Dragonbreath ignoring his homework for so long that he has to write his report while on the bus to school. Having not done any research, he invents a report about a "snorklebat". I don't have nearly the sense of literary humor that would ever enable me to put "snorklebat" in a book and make it work, but Vernon does and I well remember my son cracking up over that when he was reading the book. Serious themes: While the book as a whole is very light-hearted, it does convey a message (much like A List) about the importance of doing your work on time, as the snarky word-bubbles from Danny's collaborators occasionally nail him on. Series: 11 books? Oh yeah. And the latest one just came out this past January, so who knows how long it will go? I said at the top that this week's categories are targeted at beginning readers. That's worth repeating, because if you're writing any of this week's categories, it's a big clue. Your readers are just beginners. They're not fully independent, confident readers. Which means your job is to help them get there. Tell your entertaining stories. Share your interesting non-fiction material. Include your well-crafted messages laid with subtle care between the lines. But as you do, stay focused on how your material helps readers build both their reading skills and their love of writing. Make sure you're giving them a good, rewarding reading experience so they'll want to read some more. Thanks for reading this far, and stay tuned next week for the chapter books category.